Do Territories Get on a Roll? Linda Grenzer’s striking photo from two weeks ago got me thinking about loon breeding success. The picture is a sight that will please loon fanciers — two big healthy 9-week-olds resting side by side while their parents circle with intruders. (The chicks are holding their legs out of water, as resting loons commonly do.) Since territorial pairs almost never lay more than two eggs or hatch more than two young, the photo depicts a monster year for the breeders on Muskellunge Lake. Despite black flies and raccoons (which threaten nests), eagles, muskies and snapping turtles (which attack chicks), and constant intrusions by competing adults (which seek to drive adult breeders off of their lakes), the male and female on this lake reared two chicks to adulthood. Quite an achievement! For Muskellunge, 2016 marks the sixth year in a row of chick production. Ten chicks in all have been raised by the pair during this stretch (including one rehabbed chick we added to their singleton brood in 2014). While I am thrilled to see such an abundance of chicks come from a single lake, it is not the norm. As residents on most lakes well know, loon breeding is a dicey proposition. Consider, for example, South Two Lake, a normally productive breeding lake where the sudden disappearance of two successful breeders after 2015 left the lake wholly without a pair in May and June of this year, until it was finally resettled by a male and female in July — far too late for nesting. Or look at the Boom Lake-Hodag Park territory, where the pair had fledged five chicks across the past four seasons until the male became entangled in fishing line in the spring of 2016 near Panama City, Florida and never reached Wisconsin. Baker Lake was a consistent chick producer until 2013, when a five year-old male settled there with an unmarked female; they have lost nests to predators each year since then. Most spectacularly, the productive pair on Blue Lake-Southeast weathered the storm of parasites, egg robbers and chick predators only to see the male lose territorial ownership to a young usurper, which resulted in the chick’s death. Finally, pity the pair on tiny Liege Lake or Wind Pudding-West where, despite successful territory defense and incubation, the parents were unable to locate enough food to raise a single chick past six weeks of age. In light of the many hazards facing loon pairs, it seems remarkable that we ever see a photo such as the one above. As one might surmise from the preceding paragraphs, there are several requirements for successful breeding. Abundant food is essential, of course. Each year, many pairs attempt to breed on tiny lakes where food limitation prevents them from rearing even a single chick, let alone two. Nesting habitat is vital; lack of boggy or marshy shoreline or an island prevents many pairs from even attempting to breed. Two less obvious factors can make or break a breeding effort: 1) the ability of both pair members to maintain their breeding positions throughout the season despite an onslaught of young adults looking to evict them, and 2) the male’s familiarity with proven successful nest sites, which dictates whether the nest is positioned in a location likely to survive four weeks of incubation. Some breeding pairs have everything going for them, so that they surmount all obstacles and raise chicks to fledging year after year. Muskellunge (see photo) is large enough — at 160 acres — that food abounds, and the lake features several shoreline zones that support nesting. The resident female is much larger than average and aggressively repels intruders that challenge her. She is paired with a tough 18 year-old male — a bird experienced enough to know the locations of multiple nest sites on the lake but young enough to be in good physical condition and not vulnerable to eviction. In short, Muskellunge Lake is currently in a “sweet spot” for raising chicks, like Townline, Manson, Little Bearskin, East Horsehead, and Buck Lake. Lakes that get on a roll like these produce a disproportionate number of chicks, which will mature, return, and sustain the population. In time, these productive territories will falter, owing chiefly to the loss of one or both members of the vigorous, experienced breeding pair. For now, though, let’s enjoy the bounty of offspring that these lakes produce and look forward to the emergence of new productive territories that will succeed them. Loon capture is a blur. We set out from our house at 8:45 pm, launch our small motorboat on the first lake, wait for nearly complete darkness, and catch any loon chicks and parents that we can net easily. By the time we have repeated the process four more times, we are rubbing our eyes, our weariness justified somehow by the presence of the sun lurking just below the horizon. As an essentially negative person, what I often recall after a night of capture and banding are the physical demands of the process and my complete exhaustion. But there are dimensions of the work that are exciting and rewarding. Each loon is unique, and one never knows whether an individual will permit itself to be approached closely and netted or will be wary and elude us. So we experience many disappointments, but they are tempered by the occasional thrill of capturing an individual that, at first glance, appeared too skittish to catch. The fruits of loon capture are obvious. By marking individuals and resighting them year after year, we learn about survival rates of adults and juveniles, territory fidelity, natal dispersal, and habitat preference. We glean a good deal of important information from these data. For example, survival rates of young and adults allow us to learn whether the local population is increasing, decreasing, or remaining stable. And tracking of young loons from egg to first territory has revealed that loons develop strong preferences for breeding lakes that closely resemble their natal lake. Finally, capture is essential as a means to disentangle loons that have been run afoul of angler’s lines or lures. This year’s capture exposed another distinctive pattern in loon ecology: the presence of ecological traps. An ecological trap is a breeding habitat that appears at first glance to be a good one but ends up being poor for reproduction. For example, a field might experience a burst of insect activity during early spring, enticing songbirds to settle there for breeding, but a crash in insect levels after eggs hatch might occur that suppresses the number of young birds produced. Two nights ago, we captured two chicks from two different lakes back to back. The first territory was a shallow 11-hectare portion of Wind Pudding Lake (my favorite lake name). The chick captured there was a five-week-old that weighed a scant 0.92 kg — less than half what we would expect from a chick of that age. Our daytime observations show that the chick’s parents are no slouches; they respond to its constant begging by making frequent dives and retrieving what food they can to feed it. Moreover, the chick itself dives often to forage. But this shallow lake, covered almost entirely by lily pads (which impair loon foraging), offers scant sustenance. I am afraid that the emaciated Wind Pudding chick will ultimately starve to death, as did the chick on nearby Liege Lake, another shallow lake choked by vegetation. Loon parents on small, acidic lakes struggle to rear even a single chick, whereas those on large lakes of neutral pH often raise two. This stark contrast was highlighted for us, as the lake we visited following Wind Pudding was 1373-hectare Lake Tomahawk. To be sure, loon parents on Tomahawk must steer their chicks through countless jet skis, water-skiers, anglers, and speed boats at all times of day. But vigilant parents are rewarded with abundant food for themselves and their chicks. The Tomahawk-Sunflower Bay chick held by Mina in the photo weighed 3.02 kg, yet it was only a few days older than the chick on Wind Pudding. Clearly the strapping youngster in the photo is heading for a healthy future and likely fledging. Why on Earth would loons settle to breed on lakes that often provide too little food for their chicks? The answer might relate to the disconnect between nesting and foraging requirements. Alas, large lakes that contain many fish for loons often lack the islands, emergent marshy bays, and bogs that allow loons to avoid egg predators like raccoons. So loons looking to breed seem to be lured onto small, marshy lakes that yield successful hatches but doom their offspring to starvation. The first round of censuses in the study area each year is always bittersweet. On the one hand, it is exciting to see the crop of new young adults that have settled and to wonder how well they will defend their new territories. On the other hand, some old familiar loons are missing. This year is typical in that the disappeared veterans are mostly males. Three of 12 males of 20+ years have failed to reclaim their 2015 territory; only 1 of 12 20+ females have not resettled on their territory from the year before. Thus, male senescence lives! Among the 2016 no-shows are the Jersey City Flowage male, who bounced back from a nasty fishing entanglement in 2014, regained his territory in 2015 and hatched a chick there. Another loss is the Soo Lake male, who was among the most aggressive in our study area. I still tremble when I recall his response when we played a few loon calls in his direction in 2000. He approached my canoe to within 2 feet, sat right next to me in the stern and glowered for the better part of two minutes. A spine-tingling experience for sure! Perhaps the most intriguing findings from the first round of lake visits by Kristin and Linda are the serendipitous ones. Kristin relocated one of our oldest males — a bird known to be 27 years of age or older. Evicted two years ago from Muskellunge Lake, this loon licked his wounds and got himself back in the game by settling on nearby Swanson Lake, which had fallen into disuse in 2015. We had not seen this bird in two years and were almost ready to give up on him. Linda found a female with even greater resiliency. This old loon produced a dozen chicks over the years as the breeder on Buck Lake from 1998 to 2009. After her eviction from Buck in 2010, she floated, found a breeding position on Hildebrand in 2012 and produced a chick there in 2013. But she was driven off of Hildebrand last year. Her response to this second setback was typical of female loons — she bided her time and claimed that territory again when the opportunity presented itself. As I confront another season of hauling canoes from lake to lake, my back begins to ache in anticipation. I hope the examples of these two dogged old codgers gives me the strength to persevere! Winter for the Loons — and Me! I have been back in California for some months now, my research in Wisconsin a distant memory. A stroll to the end of the pier at Newport Beach changed that. Several of my study species — unbanded animals that probably belong to breeding populations from Alaska, British Columbia, or Alberta — were foraging contentedly off the pier’s end, as fishermen cast their lines all about them. The fishermen appeared to avoid casting near loons, so I was not alarmed by what I saw. Loons are usually adept at avoiding fishing lines (though not always). 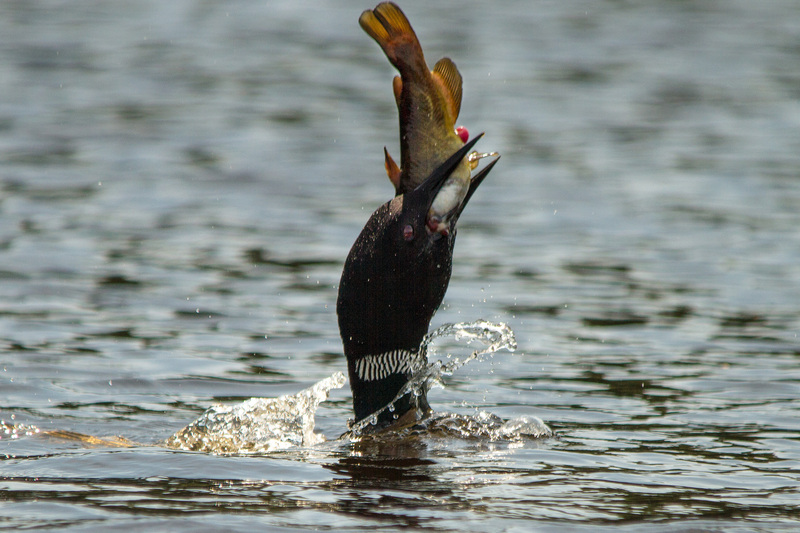 Furthermore, an ecologist would not be surprised to see loons sharing a fishing hole with anglers, since they are competitors for the same small fish — mostly smelt and mackerel. Common loons were not the only species diving and pursuing small fishes among the sea lions and occasional pod of common dolphins. It was a treat to find this juvenile red-throated loon out in the waves as well. Back home in Irvine I am crunching data, as I do habitually in the off-season. I feel some urgency at the moment, as I am about a week away from having to give a talk on my findings at the Winter Animal Behavior Conference in Colorado. I will be more positive in a week or so, but I have already confirmed senescence in two different respects. First territorial common loons older than 20 abruptly begin to show much higher year-to-year mortality (roughly 20% annual mortality from 20 on; only 6% mortality up to 20 years). Second, territory holders 20 and older also stand a much greater chance of losing their territory through eviction (again a 20% rate of loss) than do those younger than 20 (12% rate of loss). In the coming days I will explore whether the sexes differ in these respects and whether old territory holders make any behavioral adjustments to this apparent decline in health and fighting ability. Two days ago, Mark Naniot of Wild Instincts got a report that a loon on Two Sisters Lake had been hooked by a fisherman in the leg and was trailing 50 feet of monofilament line and a bobber. Mark learned also that a well-intentioned kayaker had approached the loon and cut much of the line, including the bobber, but leaving the hook and several yards of fishing line trailing. Having captured and unhooked a loon several weeks before on the same lake, we were disappointed to hear of another angling incident. Could the same bird have become entangled again? Seth happened to be collecting data on Two Sisters Lake yesterday. He found the impacted loon, which was not the Two Sisters-West male that we had rescued in June but the female from Two Sisters-East. (The lake has east and west halves, each with a successful loon pair.) Seth reported that the female was using her right leg sparingly, trailing fishing line, and had tried but failed to take off and fly on several occasions. She was not with her mate and two young chicks. Clearly the bird was in trouble. After digesting Mark and Seth’s reports, I turned my attention to the prospect of catching the impacted loon. I viewed the challenge with mixed feelings. On the one hand, this female, hatched on Crab Lake in Vilas County in 2004, was well-known to us as a rather tame individual, making capture more feasible. On the other hand, we had captured her four nights earlier, which raised the possibility that she would recall that event and be more difficult to approach a second time. The most crucial card we held was that the female had chicks to protect. Several major research programs that focus on common loons in the northern U.S. and Canada rely, more than any other factor, on the ability to approach adult loons closely at night and net them when they have chicks. If researchers could not approach adults closely during this reproductive window, we would not be able to mark them and study their behavior, health or survival. We would therefore be unable to generate models to determine whether loon populations are increasing or decreasing. In short, loon research would grind to a halt without the presence of chicks to freeze adults on the surface and permit us to catch and mark them. Last night’s adventure served as a vivid reminder of the value of chicks to adult capture. We began searching for the hooked female shortly after nine p.m. and located her quickly along the southwest corner of the lake’s eastern half. Her behavior was odd; she seemed to restrict her movements to one small portion of the lake and was not anywhere near her mate or two large chicks. She held her hooked leg out of the water when resting on the surface. Before full darkness, we spotlighted and approached her to attempt capture, but she repeatedly dove before we could get within a net’s reach. Although frustrating, this cheered us a bit, because it showed that she was still relatively healthy despite the hook. At the same time, we were vexed to see that a loon that was in dire need of human assistance and which we had scooped out of the water with ease four nights before was resisting capture. We made several more passes by the female, until it became clear that the distance at which she dove was increasing rather than decreasing. We had a loon in need of help, a huge staff from Wild Instincts on shore waiting to assist it, and no obvious means of catching the bird. The critical ingredient missing was her chicks, which were nowhere nearby and which, we felt, might have held her on the surface and permitted us to net her. We shut down the motor and listened. As luck would have it, an adult loon tremoloed far to the northwest, near the small bay where the Two Sisters-East pair had nested. Eric drove us up to the northwest corner, where, after 20 minutes of searching, we located the male and two chicks. Freshly banded from four nights before, the male and two strapping youngsters were nonetheless easy to net and pull into the boat. We set out southwards, where we had left the recalcitrant female, and released all three birds there. After several minutes of silence, the just-released male finally wailed and an answering tremolo came from 400 yards southeast. Again, we were in a bind, because the female had clearly swum a good distance away, where she would not soon encounter the chicks that we had released in hopes of capturing her. So again we netted a chick — leaving one near the male — and motored southeast to where we had heard the female. Having glimpsed the female for an instant before she dove, we gently held the chick in the boat until it vocalized. The injured female was transformed: she immediately sat up in the water, alert, and wailed to call her chick to her. We released the chick, the two reunited, and the female remained alert and protective next to her chick as we slowly approached and netted her. 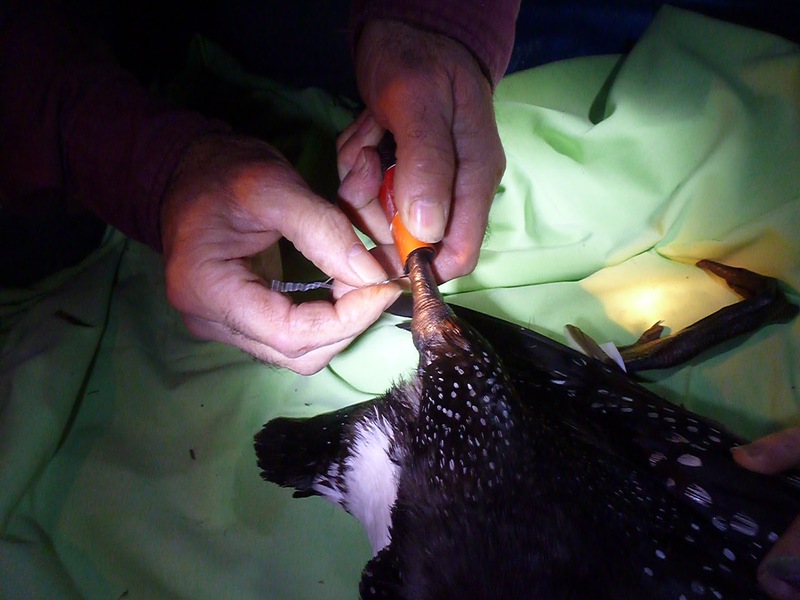 After all of our efforts, it was rewarding to learn that, while the hook had punched cleanly through the female’s leg a few centimeters above her colored leg bands (see photo, courtesy of Wild Instincts), the prognosis (according to Mark) was excellent for recovery. Looking back, we spent three hours capturing a family of loons that we had just caught and banded four days earlier. 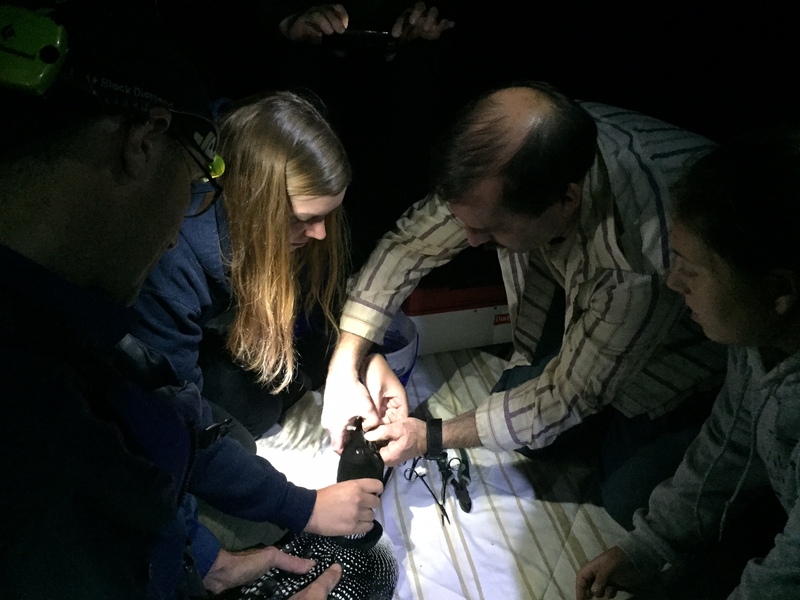 The rescue was a major production, requiring us not merely to locate and capture her but to find and capture her family in a remote location on the lake and transport them to her vicinity in order to restore her parental instincts and permit us to approach and net the impacted loon. This effort threw a wrench in our capture schedule, necessitating that we rush to three more lakes to capture loons there and cancel plans to attempt capture at two more lakes. 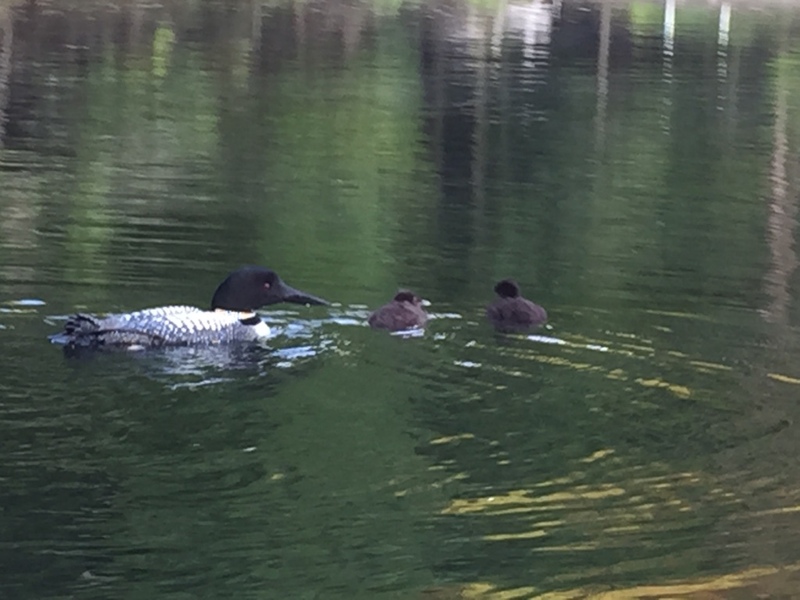 Still, our team effort with Wild Instincts left us glowing; we had rescued a loon in peril and given her a chance to return to her life as a plucky protector of two young offspring. On its face, the photo is comical. 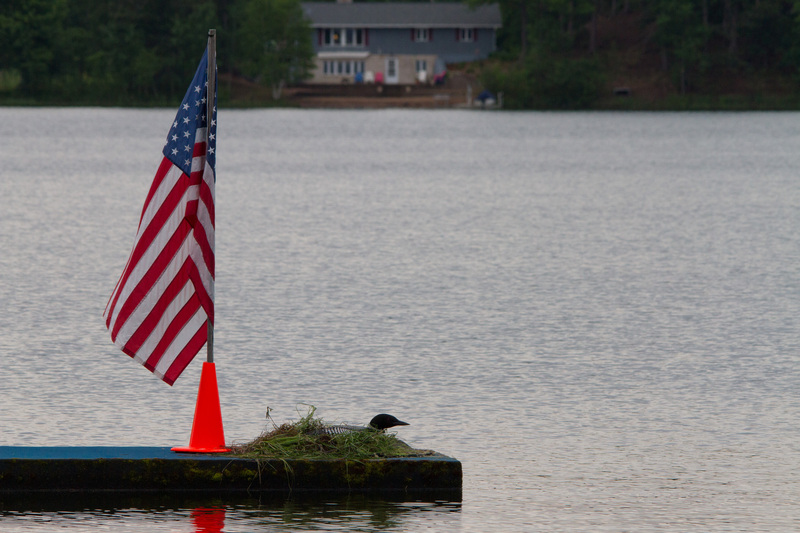 A loon sits on its egg on a swim raft, a meter from an American flag. A garish McMansion is visible on the opposite shore. Few photos of the common loon are more at odds with the image of the species as a symbol of the northern wilderness. Yet Linda Grenzer’s photo of the nest on Crystal Lake is a poignant portrait of the situation faced by most territorial pairs in north-central Wisconsin. Many popular accounts describe common loon populations as holding on for dear life. To be sure, loons are threatened by shoreline development, which reduces nesting habitat. Recreational fishing and boating kills many adults and chicks prematurely each year. And methylmercury in the food chain, swollen by coal-based power production, likely impacts the loon population as well. Against all odds, however, loons appear to be holding their own in northern Wisconsin. Despite consistent losses caused by collisions with boats and entanglement in fishing lines, populations have bounced back in recent decades. The surprising resilience of loons seems to result from two facts. First, loons prefer to nest on small islands and on boggy and marshy habitats that humans avoid. Thus, loon pairs continue to produce young on lakes that are virtually encircled by human dwellings. Second, as illustrated in the photo, loons tolerate — and rarely even benefit from — human alterations of aquatic habitats. The pair on Crystal Lake, whose nest is pictured, were in a real bind. Crystal is a very pleasant lake, but it lacks islands — the nesting spots most favored by loons — and also features neither bog nor marsh. Previous nesting attempts by the male (reared on nearby Muskellunge Lake in 2006) and a parade of 3 or more different females since 2011 ended in abject failure, the eggs an annual donation to local raccoons. Although they crawl onto it with great difficulty and complete loss of dignity, the Crystal pair decided a few weeks ago to place their nest on a low-lying swim raft. The raft is high above lake level and not equipped with any sort of ramp to assist small chicks in re-mounting the raft once they have entered the water, so we are concerned that the chicks will not be able to return to the nest (to be kept warm by a parent in the first few days of life) once they have left it. Still, the likelihood of hatch is good, and Linda and her helpers placed nesting material on the raft to keep the eggs from rolling off. We are hopeful that the loons can cope with the problem of nest height just as they do with a host of other anthropogenic obstacles each day in northern Wisconsin. I shall keep you informed. If the Crystal pair can hatch and rear their chick to adulthood, they will be a vivid example of the capacity of loons to adapt and thrive in an environment thoroughly dominated by another species. The Loon Project counts on efficient exchange of information with lake residents and loon enthusiasts as a means to acquire good scientific data. We cover enough lakes — about 120 this year — so that we make visits to them only once every 5 to 7 days. This permits us to track the identity of the breeding pair and record their breeding activity. Over time, we accumulate important data on territorial fidelity, eviction of breeders, and their relocation to other study lakes. But weekly hourlong visits leave lots of holes in our knowledge. So it is helpful that almost all of our lakes are occupied by humans who take an interest in “their loons” and contact us or the Wisconsin Department of Natural Resources when something is amiss. Yesterday, a resident on Flannery Lake called with distressing news. The male on the lake, a 14 year-old reared on Washburn Lake, was dead and being fed upon by a mink. We were particularly saddened to hear such a report from Flannery, because the breeding pair had attempted to rear young every year there since we began to follow them in 1993, but had not fledged a chick successfully since 2006. That unlucky string seemed about to be broken when, earlier this month, the pair hatched two vigorous chicks. We were delighted, though perhaps less so than lake residents, who had watched their loon pair build nests, lay eggs, and incubate them diligently year after year only to lose them — or their small chicks — for reasons unknown. This morning Seth visited the lake to see whether the female and chicks were still alive and whether another male had taken the deceased male’s place. He snapped the photo above, showing that the female, who is at least a quarter of a century old, is alive and well, as are both chicks. However, he also reported that a possible incipient pair was present on the lake. This makes sense. As I have noted in recent posts, male loons use their yodels to keep hopeful settlers at bay. With no male present to yodel, intruders flying overhead readily land in the lake. Since the female cannot safely leave the two-week-old chicks alone, she cannot easily engage intruders and drive them off. In short, Flannery is prone to intrusion and settlement. So there is reason for hope for the young Flannery chicks. If she is vigilant and fortunate, a female can raise a chick, perhaps even two, without help from a male. Considering the long odds of such an achievement, we should certainly resist optimism at this point. We will keep an eye on this fractured family, and I will let you know how things turn out. In his routine visit to Two Sisters Lake to check on the status of an incubating pair, Chris was alarmed to find out that the male had a hook lodged in his cheek and fishing line protruding from his bill. This male — captured and marked in 2010 as a breeder on Brown Lake before being evicted two years later — had been a “floater” for the past three years before replacing the absent Two Sisters male this spring. I was thrilled to see this tame bird get his life back together. When Chris reported the hook in this male’s bill, I wondered if this bird was just snakebit. The entanglement could not have occurred at a worse time. The male and his mate were on the brink of completing four weeks of incubation and hatching of two chicks, which require great care and protection at this stage. Indeed, between yesterday morning and afternoon, the male had finished incubating the second egg and left the nest for good with two head-sized chicks alternately hiding under his wing and riding on his back. Attentive as he was, the hooked male was ill-equipped to defend his brood. As we have learned recently, male loons are especially vital to the defense of a pair’s young chicks, because the male-only yodel discourages landing by intruders (which, on occasion, kill young chicks) and because males are active defenders of chicks towards intruders that approach them in the water. With the hook lodged in his mouth, the male was unable to open his bill, and his protective vocalizations yesterday were so muffled and distorted as to be ineffective. Upon receiving the report of the hooked male yesterday, we agonized over the decision of how to proceed. Adults with small chicks are the easiest to capture, so we were not worried about catching the male. However, one must take great care when young chicks are present, as they are tiny and are always on, next to, or underneath the wings of the adults. When one is netting the 10 to 12 pound parent and hauling it into the boat, it is conceivable that an unseen chick might be crushed beneath it. Would it be wise to wait for a few days or a week, until the chicks were larger and stronger, before attempting capture? In the end, we decided that the male was impacted enough that we were endangering his life and those of the chicks if we did not act immediately to help him. So last night, Joel, Eric and Seth set out on Two Sisters to try to: 1) gently separate the tiny chicks from the male, and 2) catch the male so that the hook could be safely removed by Mark Naniot of Wild Instincts, who was standing by on shore. As you can see from Seth’s photo, we caught the male, and Mark expertly removed the hook from his cheek. The chicks were unharmed in the process. The male seemed in good shape, considering his close encounter with an angler’s line. (We suppose that he became hooked only a day or so before we caught him.) Still, we shall be checking today to see that the family is back to normal. While there are many dangers facing loons in the first few weeks after hatching, the team of rehabbers and loon researchers has given them a chance to confront these dangers without human impacts layered on top! Jersey City Flowage Male Healthy and Back on Territory! We were horrified last spring, when one of our best-known territorial males — and a super tame bird to boot — became hopelessly entangled in fishing line. This male, the long-term resident on Jersey City Flowage (“JCF”) had swallowed two lead sinkers, and monofilament line was wrapped tightly about his bill, making it impossible for him to eat. In short, the JCF male was destined to perish quickly from lead poisoning and/or lack of food. However, the folks from REGI freed him and used new technology to pluck both lead sinkers from his gut. Although he lost much of his tongue because of the fishing line, we were heartened when Linda found him in July of last year gorging himself on bullheads near his old territory (see photo below). But recovery after a brush with death was just the beginning for this bird. In order to reclaim his previous position, the male needed to regain his strength, migrate successfully to his winter quarters, survive the winter, migrate back north, and then — most challenging of all — regain possession of his former territory, which had been quickly snapped up by another male after the injury. (The new male bred successfully last year and was banded by our team.) Yesterday, Linda confirmed that the old, war-torn JCF male has negotiated all of these hurdles and settled in a breeding pair back on his old territory (see Linda’s photo below). We presume that he is also with his old mate, but she is one of the few wily adults that has managed to elude us, despite several efforts at capture. So she is still unbanded. The resilience of the JCF male is important. He is only the third adult to have been severely injured by fishing tackle, lost his territory, and recovered to reclaim it. Three data points can never be a robust sample, but we also have many cases where entanglement occurred and adult loons did not recover. In fact, we have about 9 well-documented cases of death following entanglement, which, combined with the three success stories, yields an estimate of 25% likelihood of recovery. So while the story of the JCF male’s journey from disaster to full recovery lifts our spirits, it is hard to forget that this is the exception, not the rule.